Here’s the summary of Game Week 24’s defending and attacking numbers. A few changes to go over. Even with all of the scoring that took place in Week 24, eleven teams are now defending better than the league average. Last week I mentioned that Sunderland and QPR were on the edge of the bubble of having significant better defensive numbers than most other teams. Both teams had shutouts in Week 24 and that gave a great boost to their stats. Unfortunately, the same cannot be said for Arsenal, their 2-2 draw with Liverpool has knocked them out. So who’s significant now? Chelsea and Tottenham remain number 1 and 2 (Though the draw with Norwich did knock a chuck out of Tottenhams score), and Sunderland and QPR join them. 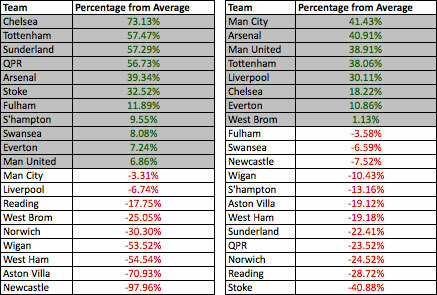 Both Sunderland and QPR have some good value players, if you are looking for some differentials. Sunderland also has a nice run a game for the next several weeks, and QPR is not that bad either. They are worth a look. At the other end of the table, Wigan, West Ham, and Aston Villa have defenses that are significantly poorer that the rest of the league. And Newcastle’s defense is even worst than them. They could have some good games, if the matchups are good, but you might want to wary of these players. While the number of teams with better attacking numbers has increased, the save five remain significantly better, but in a different order: Manchester City, Arsenal, Manchester United, Tottenham, and Liverpool. By scoring 8 goals in the last 2 weeks, Arsenal has jumped up to the number 2 spot, just under City. That’s some good news if you are looking for Forwards that are under 9m. Liverpool rounds out the top 5, but with a Double Game Week coming up for Week 26, you could see their numbers jumping up soon. At the other end, Reading and Stoke have both not been able to turn their offenses around much and remain significantly poorer than the rest of the league Though, Adam Le Fondre has managed to get 5 goals in 3 games…so he could be a nice CHEAP differential if Reading ever decide to start him.